Welcome back to another round of Ask the Home Flooring Pros. 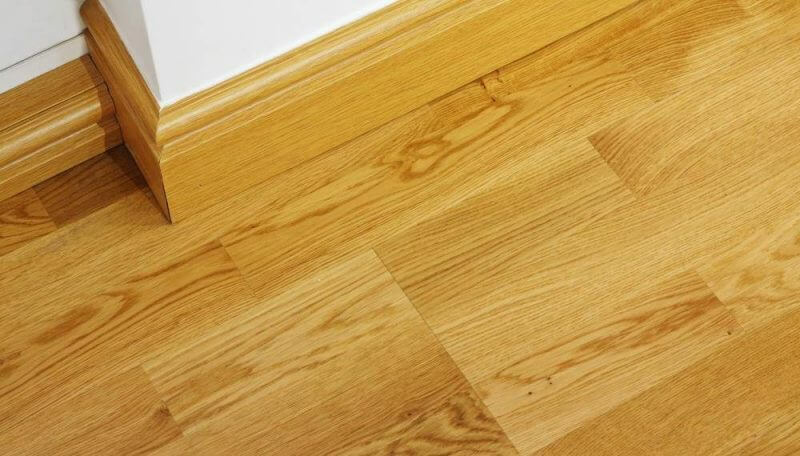 Following our recent post on maple flooring we had a question from a reader in Texas asking us to explain more clearly the difference between water based and oil based polyurethane and to outline the pros and cons of each. So lets compare and contrast these two types of polyurethane and see how they match up. The difference between water based and oil based polyurethanes isn’t one of better and worse. We use both types with excellent results. It’s the project, not the product, that determines our choice. Oil-based finishes were once more durable, but the new generation of water-based polyurethane is remarkably hard and long-lasting. There is no discernible difference in how long they last. Also, professionally finished floors should feel satiny smooth, whether the finish is oil or water based. Click here if you want to learn how to keep your wood floors smooth and shiny. Let’s cover a few basics before discussing which is best for specific wood types. Water based polyurethane can be recoated in 4-6 hours. Up to 4 coats can be applied in a day. Furniture shouldn’t be placed on the flooring for 12 hours after the last coat is applied. Oil based poly can be applied in just one or two coats per day depending on the product instructions on the can. Wait 24 hours after the last coat to walk on it and 48 hours before moving furniture back into the room. Pro tip: Speaking of coats, oil based polyurethane has more solids than water based finish, so just two coats are required. We recommend three coats of water based poly. Water based finish has a light odor. No respirator is required, but you might want to crack a couple windows for fresh air. Oil based polyurethane has a strong, fumy odor. We recommend wearing a respirator and keeping pets and anyone with breathing issues away from the smell. Keep the area ventilated. The odor will linger until the polyurethane is fully cured in a couple days. Durability: While both are long-lasting, there is a difference in how they wear and what you can do to protect the finish. Water based poly is harder, so it is more susceptible to surface abrasion caused by fine debris. For this reason, vacuum your flooring regularly using a hardwood floor vacuum. Oil based finishes are softer, so they don’t scratch as easily, but they dent more readily. While keeping debris off the flooring is still a good idea, it’s also important to put pads under furniture feet to prevent denting. Look: These finishes look different when applied and even more so as they age. Water based polyurethane dries clear and remains clear. Oil based poly has an amber tone that immediately darkens the wood. As it ages, the amber hue deepens. Cost: Water based polyurethane cost is two to three times higher than oil based products. When cost and coats are calculated, this works out to about 35 to 50 cents per square foot for oil based poly and 80 cents to $1.35 per square foot for water based polyurethane. Well known brands like Minwax produce both types of poly making it easier to compare prices. The look is what matters. Drying times, odor and cost are negligible factors when deciding whether to use water based vs. oil based polyurethane. The smell will be gone in a week. You’ll live with the look for a decade or more. Will your wood look better with a clear coat or an amber coat? Here’s what we recommend. Water based polyurethane: If you want your floor to stay the same color, choose water-based polyurethane. Wood that is gray, white or light looks better with a clear coat, i.e., a water based finish. Woods with a hint of yellow in them already, such as pine, fir and ash, become even yellower with an oil-based finish. Go with water based poly if that’s a look you want to avoid, or choose an oil based finish to enhance it. Oil based polyurethane: Darker wood tones are enriched by an amber hue and an oily sheen. Oil based polyurethane can bring out the vibrant color in red oak, cherry or exotic woods like teak. Looking for wood floor stain color ideas? With this approach, the decision about whether to use oil based polyurethane or water based polyurethane will no longer be hypothetical. You’ll have tangible finished flooring samples you can see, feel and run your feet over, if you want. Your decision will be much easier when you do. Now you’ve chosen your finish you should check out our guide on how to apply polyurethane. I have two contractors telling me two different things. 1 will use poly. 1 will use water based. the poly guy says if I use the water based on my older floors I will end up with crackling…like broken glass and jagged edges as the floor moves and over time will not be happy with the finish. the water based guy says his way is the way to go for a more durable floor and no amber color like we have currently. Is the water based hard like glass and will it crack against the grain as the poly guy states?? Hi. Crackling can occur using oil based or water based poly. The crackling occurs for several reasons. First, a final coat was put over a surface that had not completely dried. Second, there was contamination on the floor that was not properly removed(eg. oil, liquid) prior to applying the finish coat. Google it to find out more. Crackling can occur using either oil based or water based polyurethanes. One reason it occurs is that the surface the poly was applied to was not dry or was contaminated. Google for more results. We had one person install our floor. We got rid of him and hired a second person for the staining of the floors. The second person stained a coat or two of water based . And now that the construction in the house is done he returned for the last coat. He said that the floor started to come up because the first guy didn’t install the floors properly. He gave us the choice now. he can finish the Lst coat and it won’t be smooth. Or he can resand all the floors and restrain with oil based finish. He said he’s going to do 3 coats so that the oil base will act as a glue and hold the pieces down better. In addition it’s more flexible so we won’t notice cracking. Is all this true or are w ending scammed for another 6,000 to resand and stain ? SCAM. The planks are connected to each other and to the floor during installation. There are no planks “coming up”. And, the application of anything on top of a floor is not going to fasten the floor to the sub-floor.